Mel Gibson in a western! This movie is full of fun and laughter. It's very entertaining with an all-star cast including Mel Gibson, Jodie Foster, and many more. Watch out for several cameo appearances by other stars, too. So if you or your family likes western films, this hilarious PG-13 film is definitely worth watching! This is a story about a card player named Brett Maverick (Mel Gibson). He is on his way to a poker tournament when he decides to stop in another town for a while to win some rounds of poker. That’s where he meets Annabelle Branford, a beautiful poker player that is played by the lovely Jodie Foster. 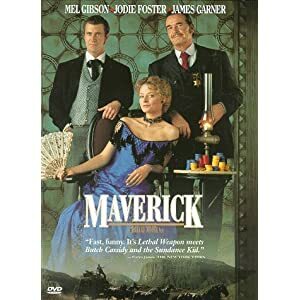 A lawman (James Garner) appears and makes things a little more interesting and comical.